It's Christmaaas! I hope you all have a wonderful day today with lots of presents and food. I only have one question to answer for this month's Q&A, but it's a doozy! Q. hiddencait asks: Is there a series that you really want to try doing fanmasks for, but haven't attempted yet? A. Oh boy, this is a fun question! As usual, I have my creative life cycle planned out until my golden years. I'm going to answer this question with visuals! The first big fandom I'd love to create masks for would be the Kushiel's Legacy series of books by Jacqueline Carey. For those who don't know it, it features such inspiring themes as angels, masquerades, and tattooed courtesans, each who belong to a specialized house symbolized by a flower. I can best describe it as Game of Thrones from the courtesan-spy's perspective. the first book's cover. See my Kushiel's Legacy fan project blog for more! The prototype of Cereus House's set. I've already done a couple of prototype headpieces with matching necklaces for the Camellia and Cereus Houses, but I'd love to take this imagery even further and make a set of masks with matching necklaces for each of the twelve houses of the Court of Night-Blooming flowers! Imagine if I ever learned how to make tooled corsets and other accessories, I could add that to the ensembles for a complete head to toe costume transformation! A closer look at the Cereus set. 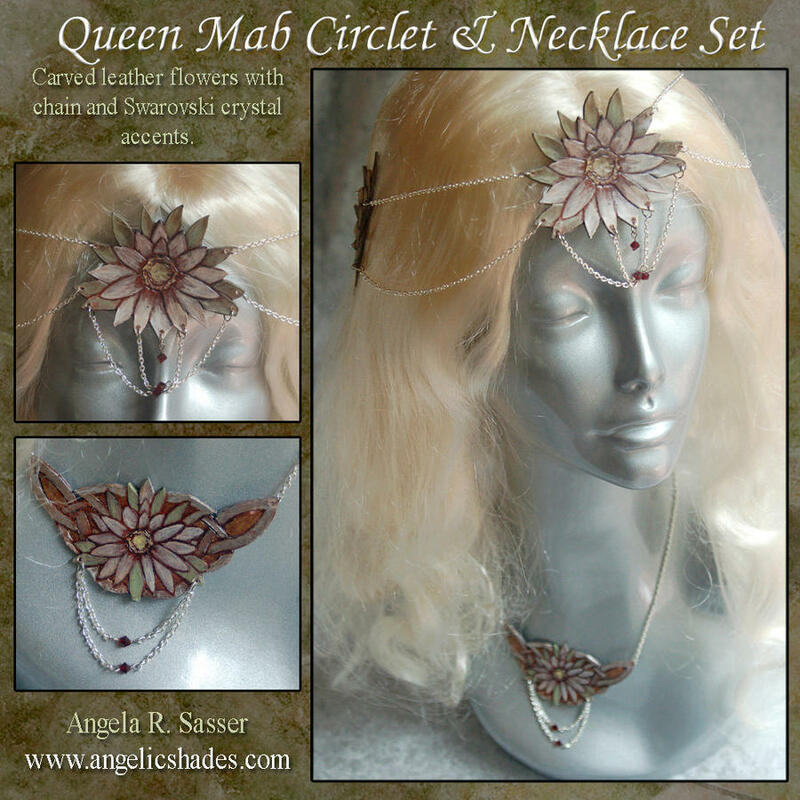 Featuring silver chain and garnet Swarovski accents! Ohhhh and not to mention that there are masquerade scenes in the books where each House dons a unique costume representing a seasonal theme. That could be a whole other series! I'm going to stop writing now before my muse explodes. I hope you enjoy this glimpse into the possibilities of my fandom love! Have a merry Christmas, all!